With Hilti's TE 4 18-Volt Lithium-ion SDS-Plus Cordless Rotary Hammer Drill, professionals now have corded drilling performance in a cordless tool. This tool is engineered with a powerful and efficient motor combined with Hilti's proven CPC battery technology. It boosts productivity with the capacity to drill more holes than any other 18-Volt cordless rotary Hammer in its class. Powerful, compact and convenient the TE 4 18-Volt Rotary Hammer Drill is the cordless drill for professionals like you. Possible drilling range of 3/16 in. to 9/16 in. Tbook.com crawls the web to find the best prices and availability on Hammer Drills and related Tools and Hardware products like Hilti TE 4 22-Volt Lithium-Ion SDS-Plus Cordless Rotary Hammer Drill. For this page, related items include products we find that match the following keywords: "Hammer Drill" at our vendor partner Home Depot. 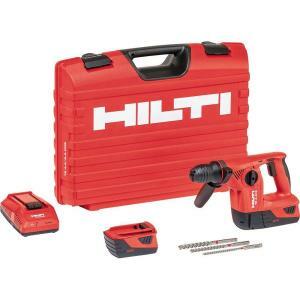 Hilti TE 4 22-Volt Lithium-Ion SDS-Plus Cordless Rotary Hammer Drill is one of 148 Hammer Drills and related products listed in the Tools and Hardware section of Tbook.com If you have any questions on this product, please give us a call at 734-971-1210 during the hours of 9am - 5pm EST for assistance. Thank you for shopping at Tbook.com, the Internet Department Store!